With the scleral lens market growing immensely, it is tempting to forget the obvious and well established care for our patients and to neglect our fitting skills with corneal GPs. 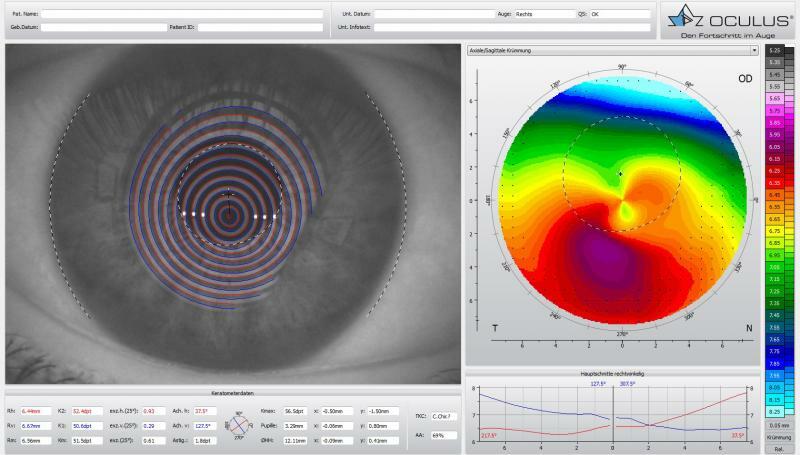 I’m also an advocate of scleral lenses, but is it always the first choice in fitting specialty lenses? 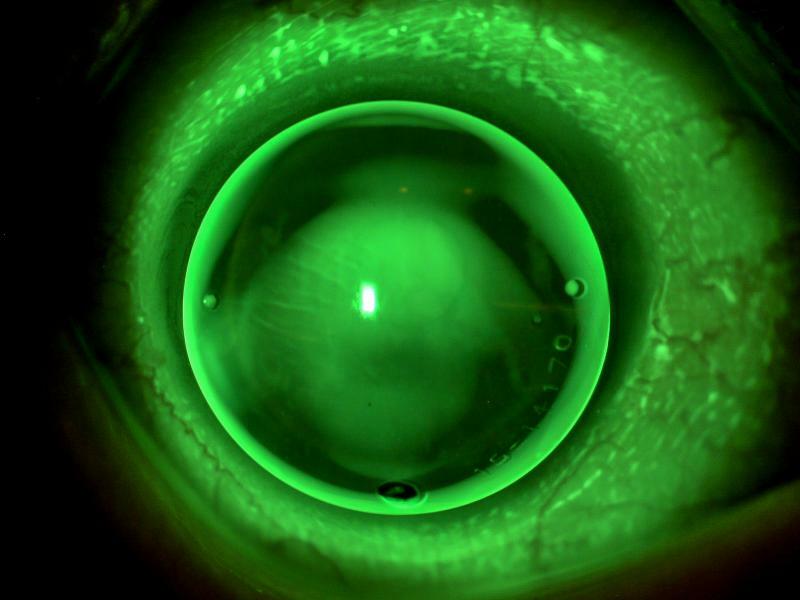 This case report refreshes our fitting skills and helps us to not forget to “stay in contact” with corneal contact lenses. A 48-year-old Caucasian female was referred to our specialty lens clinic with a recent diagnosis of keratoconus. She was previously fitted without the diagnosis of keratoconus with corneal GP lenses a few years ago, but she lost the contact lenses probably due to too little contact on the ocular surface. Keratometry values were: RE 50.6/52.0D and LE 53.1/56.8D. 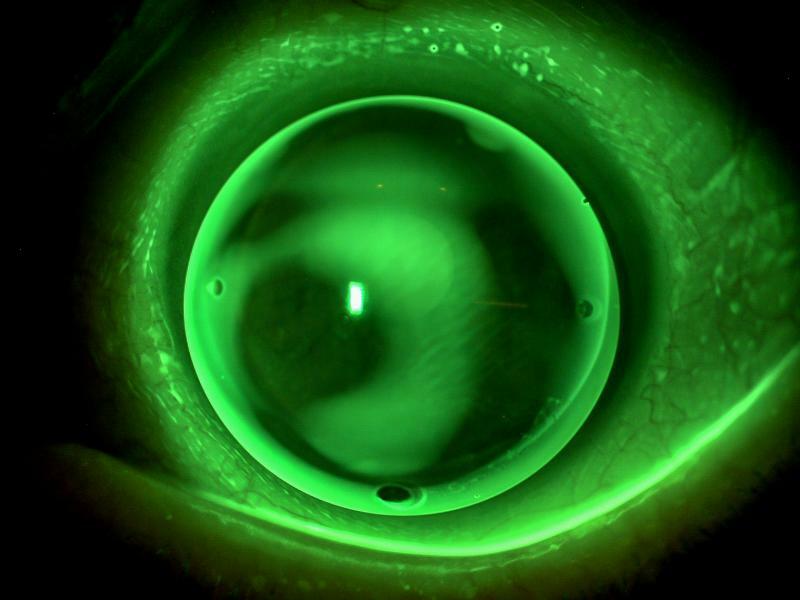 The cornea showed Descemet folds, and a wrinkling of the epithelium due to keratokonus﻿ was noted on the tear film fluorescein pattern observed prior to lens fitting. No stromal scarring was seen, and no surgical procedure was performed to date. On both eyes, she showed nasal pingueculae and grade 2 bulbar conjunctival redness. The topography for both eyes shows an inferiorly decentered apex (see figure 1 and 2). To match the lens to the topography, a quadrant-specific lens design was used with an inferiorly decentered optical zone (see figure 3). This design has better centration properties given that the optic zone and the apex are located inferiorly, and the lens can fit at the center of the cornea. The lens is standardized prism-ballasted at 270° and has an eccentricity of 0 at 270°. Figure 3: Schematic drawing of quadrant-specific lens design with inferiorly decentered optical zone (dotted line) for inferiorly decentered apex. The comfort with the final lens (Figure 4a+b) was very good until the end of day. The VA of the right eye was 0.9+ and left was 1.0-. The lenses were renewed at the 12-month check up to meet the visual demand at distance. Still no reading glasses were needed. After 19 months, the patient still reported a very good comfort score, no loss or displacement of the lenses, and that foreign bodies under the lens were rare. In the meantime, reading glasses for long reading hours with +1,25D were prescribed in addition. 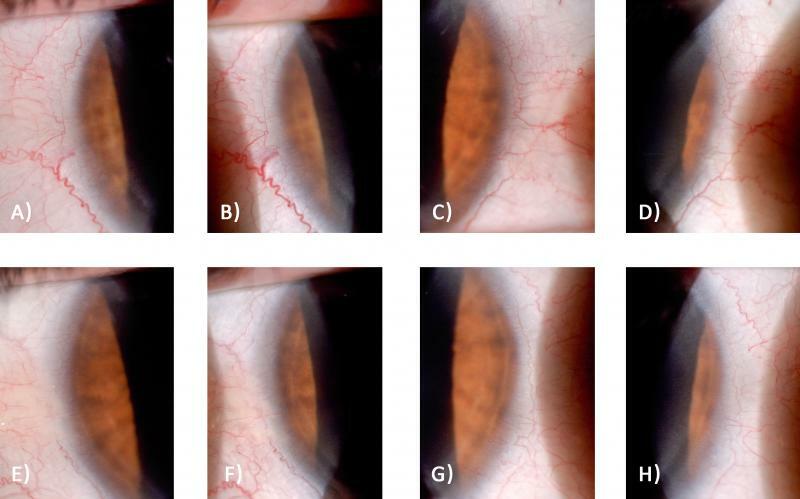 The limbal vessels at all four quadrants compared to baseline showed no change in the slit-lamp images at 16x magnification (Figure 5). Also, topography didn’t change outside of limits after lens removal compared to base line. 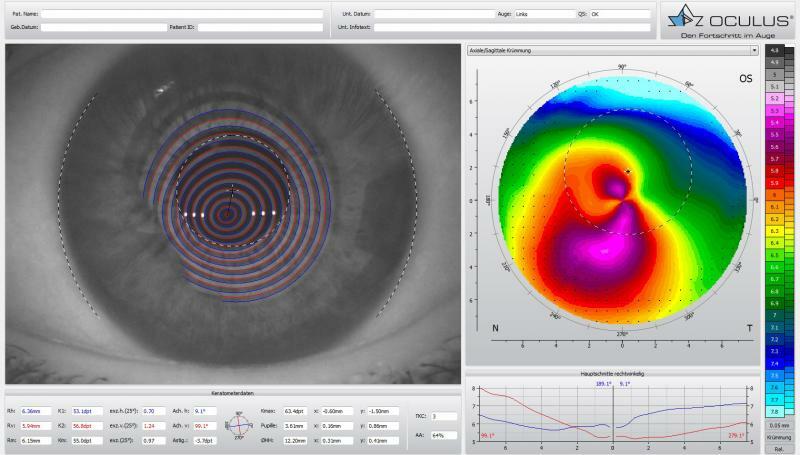 Well fitted corneal GPs are an established and well accepted correction method for the irregular cornea when the best lens geometry is used in reference to the corneal topography. A slight clearance or gentle apical touch, a large well-aligned peripheral landing area and an appropriate edge lift assures long-term contact lens tolerance. Therefore, good documentation including digital slit lamp imaging is important to follow up a healthy lens fit and, if needed, introduce an interdisciplinary collaboration. Therefore, don’t always use big guns to shoot sparrows, and be fit as a contact lens fitter and “stay in contact” with contact lenses. Markus Ritzmann graduated from Olten SHFA in Switzerland and did his MSc at the Aalen University﻿ in Germany - in cooperation with the New England College of Optometry and Pacific University College of Optometry (USA). 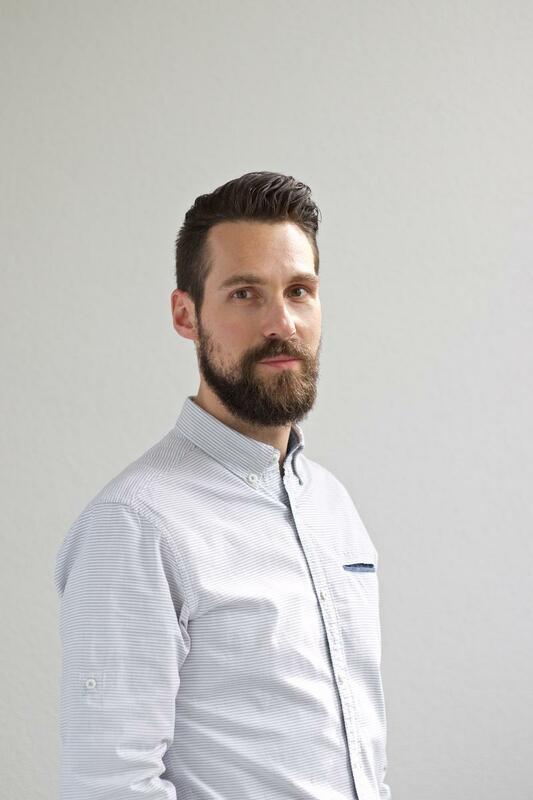 Since 2007 he has been working at the RGP laborary (Falco Linsen AG) and established a the specialty lens practice (Linsencentrum) there in Switserland. He is a consultant for contact lens fitters and reglarly runs workshops in specialty lens fitting. Markus is a member of the SBAO (Swiss optometric association) and candidate for the Fellowship of the American Academy of Optometry.